The beer you are holding is unique. 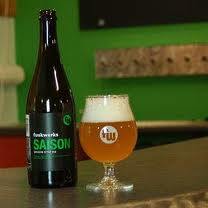 A special strain of yeast and a warm fermentation produces a beer of exceptional flavor and aroma. An extended secondary maturation and bottle conditioning ensures all these unique qualities are preserved and evolve over time. Serve at 50°F in a tulip glass. This tawny orange beer pours with a rocky white head. Aromas of passion fruit, tangerine, and black pepper hit the nose. Flavor is a cascade of orange, lemon verbena, ginger and pepper. And in a second it is gone, finishing with a dry and lingering bitterness that awaits another sip.